There’s no shortage of imagination in Terry Gilliam’s The Imaginarium of Dr. Parnassus, but when it comes to other matters — a compelling story for example — the movie is running on empty. Less a movie than a tribute to visual abundance, The Imaginarium can succeed only for those who find a portal into its dense and impacted world. Count me among those who couldn’t. Look, I’ve rooted for Terry Gilliam ever since 1981 when I interviewed him in connection with Time Bandits. In the middle of that interview, Gilliam, who was working on a room-service lunch at a Denver hotel, belched. He followed this untimely expulsion of gas with a mischievous giggle. As this otherwise insignificant episode suggests, Gilliam has an ability to turn odd moments into infectious comedy; he also fearlessly follows his many muses, sometimes driving his movies into muddy ditches of confusion. 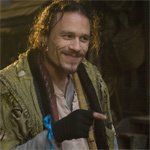 Such is the case with the exhaustingly muddled The Imaginarium of Dr. Parnassus. Watching The Imaginarium of Dr. Parnassus — notable for being Heath Ledger’s final movie — is like being in a room with a brilliant conversationalist who delights in going off on endless tangents. You admire the skill and effort, but after awhile, you just wish he’d shut up. Many of Imaginarium’s most severe critics have called the movie "indulgent." I’m not sure that goes far enough in capturing the spirit of Gilliam’s visually dense cornucopia of chaos. The movie’s confusion also extends to its casting: Four different actors wind up playing the same character. Tony — the character in question — becomes a pawn in the efforts of Dr. Parnassus (Christopher Plummer) to win a bet with the devil (Tom Waits). That’s a reasonably epic conflict, but amid the bric-a-brac of Gilliam’s movie, Parnassus’ bout with the devil seems more fussy than Faustian. Gilliam didn’t begin with a collaborative approach to casting. The use of multiple actors for a single role stems from the fact that Ledger died before the film was completed. In his stead — Johnny Depp, Jude Law and Colin Farrell signed on to finish the work. Having others fill in for Ledger — ghoulish guest shots — isn’t quite as disorienting as it sounds, but it doesn’t quite do the trick, either. The movie arrives marked by an unhappy coincidence that seems to have unsettled most critics. The first time we see Ledger, his character is suspended from a hangman’s noose, a macabre reminder that the fine young actor no longer dwells among us. Saved from death, Ledger’s Tony joins Dr. Parnassus’ traveling troupe as it bounces around Gilliam’s depressing cityscapes, contemporary London filtered through Gilliam’s imagination. When not rattling around London, the characters enter an overblown fantasy world that’s reached via a portal located on the stage used by Dr. Parnassus to present his revue. No more need be said about the story; it didn’t seem to matter all that much to Gilliam, and I certainly didn’t give a hoot about it, either. A friend who had seen Dr. Parnassus before I had a chance to preview the movie told me that it was bad, comparing it to Gilliam’s woeful Brothers Grimm. I don’t know if I’d go quite that far, but I had plenty of trouble finding a way into The Imaginarium of Dr. Parnassus, a movie that’s less an entertainment than a display of ... well .... er .... I’m not sure I know what. Best to sigh, wish Gilliam well and move on.